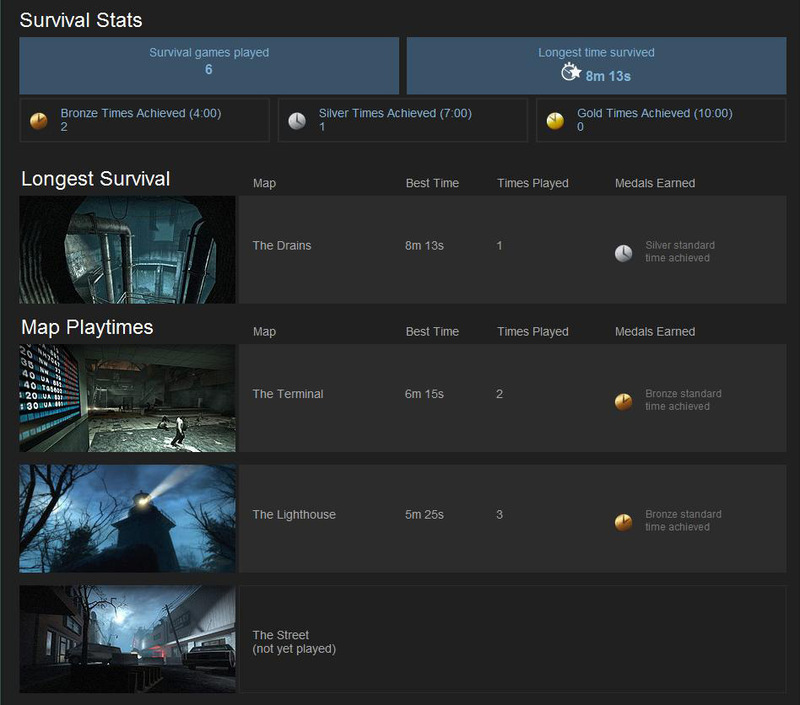 Survival Mode pits your team against never ending waves of infected. Sounds simple. 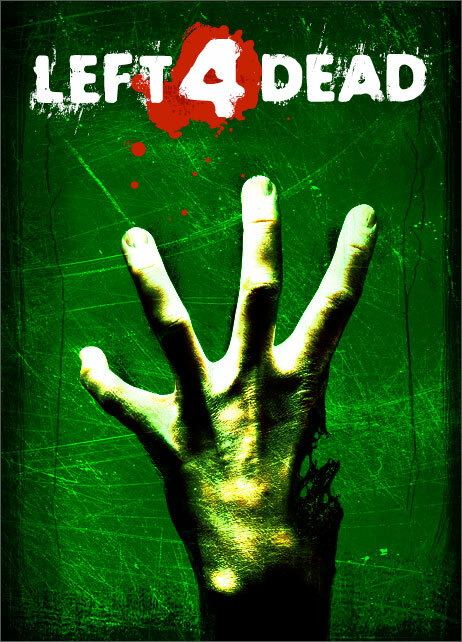 Just trap the survivors in a small part of a map, unleash the hordes, and record the longest time. 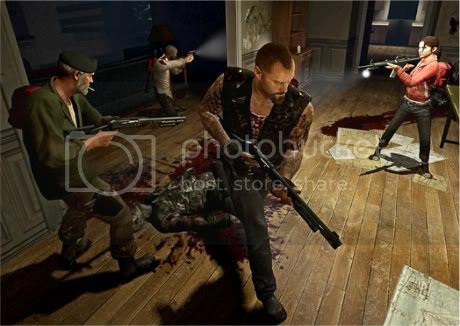 Survival Mode, which will be released next week as DLC (downloadable content), is actually a bit more than that. this update is out! Survival mode is Hard! The stats page is broken up into four different pages: Overview, Weapons, Versus and Survival. The Overview page contains an at-a-glance breakdown of your overall gameplay stats: your most recent game data; favorite characters; favorite level one and level two weapon; and how often you use and share pain pills and first aid kits. 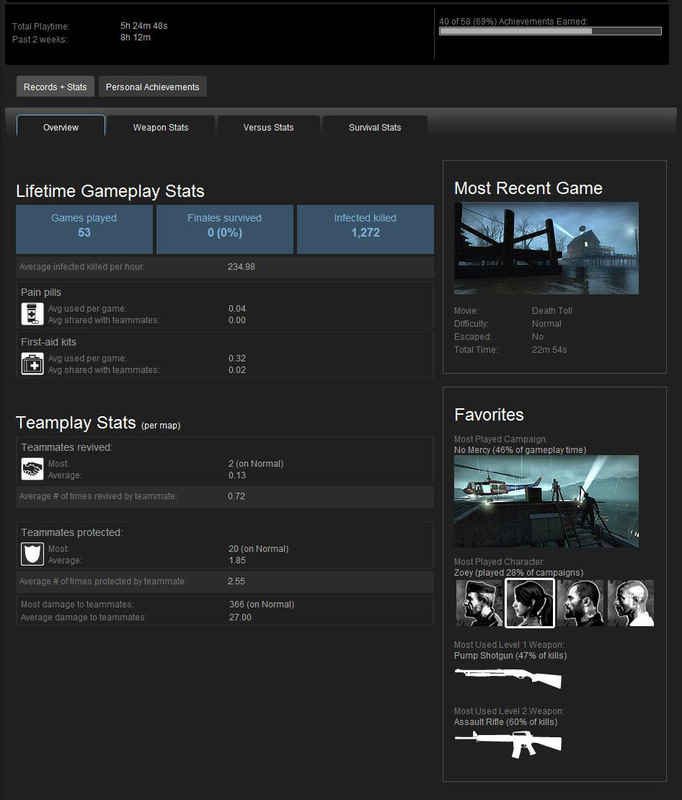 You can also see your total games played, finales survived, and the total number of zombies you have killed so far. 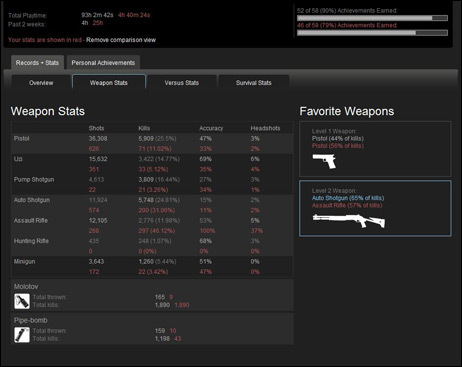 The Weapon page displays your usage of the various weapons available in Left 4 Dead. For each weapon you use in-game, you can see the number of shots fired; your total kills with that weapon; your head shot total; accuracy; and percentage of kills. 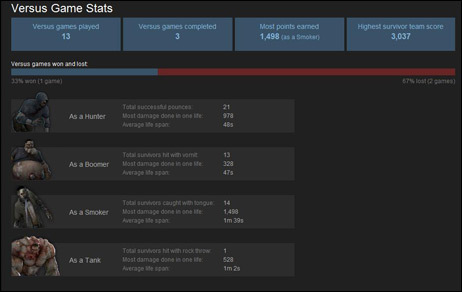 The Versus page shows how often you play as each of the playable zombies in Left 4 Dead, and how well you perform with each. For every zombie type you can track your average life span; the most damage dealt in a single life; and the number of special attacks you did successfully. Additionally, you'll be able to tally the number of Versus games played you've played to date; the number of games completed; and the highest Survivor Team Score you've obtained. 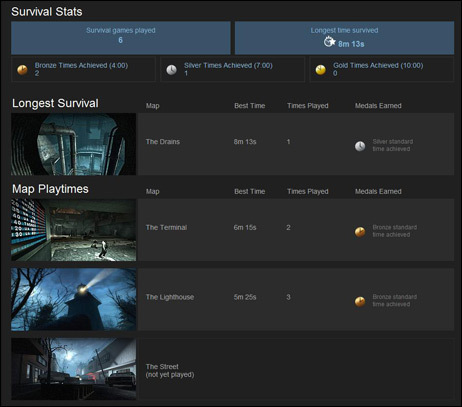 The Survival page tracks your best time; the number of times you've played, and your medal level, if any, for each of the Survival maps. You can also track your overall Survivor progress, with a running tally of your total medal count for each medal type, as well as your absolute best time for any map.